Experience America’s most famous man-made waterway! Watch video and explore upcoming events below. Meet the real men, women and children, the politicians and famers, merchants and laborers who came north to build the Erie Canal. The weekend will feature nearly 300 events at historic venues across the state where you can enjoy New York’s rich culture and heritage. Take a trip back in time when the canal was in its industrial heyday. The Albany Symphony will celebrate the July 4, 2017 Eric Canal Bicentennial with Water Music NY, a one-of-a-kind journey from Albany to Buffalo. Musicians will travel the Canal by barge for 7 days, partnering with canal communities to create and perform new works by gifted New York composers. Buffalo to Albany - Enjoy beautiful scenery, fascinating history, and a one-of-a-kind cycling experience on this fully supported ride along the canal. 36-mile bike tour of the historic Erie Canal. Statewide canal celebrations including nature and history walks, museum and gallery exhibits, rowing regattas, kayak and canoe outings, musical performances, boat tours, and more. 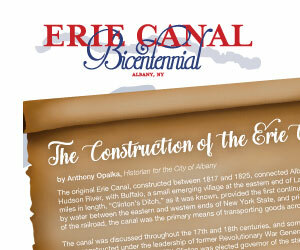 Erie Canal retrospective upon its bicentennial. The NYS Museum’s yearlong exhibit, Enterprising Waters: New York’s Erie Canal features artifacts and documents from the State Museum, State Library, State Archives and other items on loan. 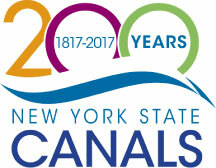 The exhibit demonstrates the Canal’s value to NYS history and its relevance to contemporary audiences. The Museum is committed to engaging youth and families by including children’s hands-on educational programs. The Underground Railroad History Project’s, The Wedding of the Waters: The Erie Canal Changing America, is a travelling exhibit meant to engage contemporary audiences in the cultural impact the Canal had on the African American experience and its role in freeing enslaved people. The museum has partnered with the Dutch Apple Cruises for Irish Heritage Troy Lock Cruise, a guided tour focused on the Hudson River and Albany’s role in linking the Great Lakes with NYC. 427-1916 . Crailo State Historic Site will host Discovery Days focused on the evolution of Hudson River communities as a result of increased commerce and traffic. The program will engage young people and their families and demonstrate the Canal’s value as a major water way through hands-on experiences.